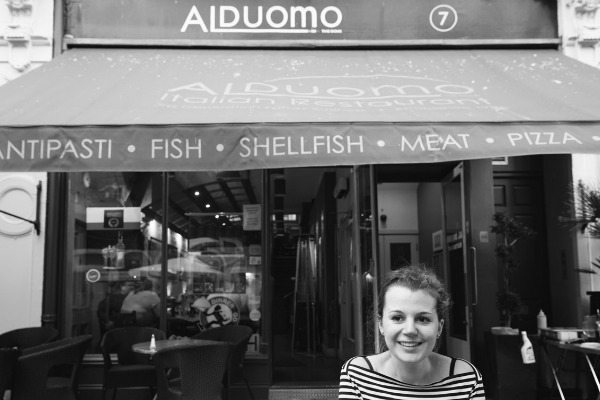 Al Duomo is an institution in Brighton’s ever growing Italian food scene. What I particularly like of them is the variety in their food offering; the menu is composed of a healthy mix of classic and modern dishes suitable for all tastes and I’m excited to spot a few dishes that I haven’t seen in a menu for a very long time. The best way to describe what they do is as ‘cucina casolinga’, Italian for ‘home cooking’. This time I had the honour of having my wife’s company for this review. We take a sit outside but that changed soon as it was a bit cold to stay out. As we order our drinks, we scan the menu and discuss how extensive it is and how hard it is to make a choice. We’re often spoilt by simplicity and having such an extensive menu made things a bit difficult. Thankfully Patrick, the restaurant manager was there to help and suggested a couple of signature dishes that might work well for this review. We took his word for it and ordered as he suggested. First off was the Fritto Misto… my word that was a treat! 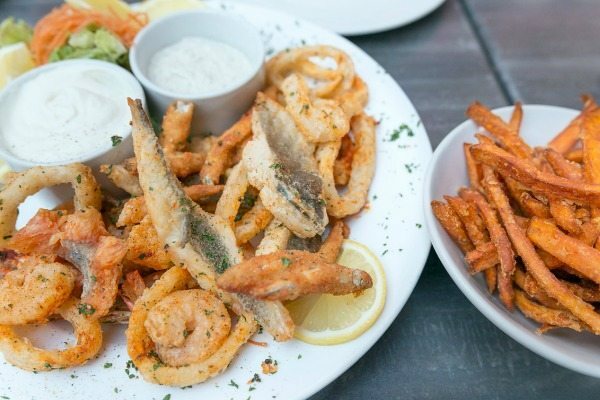 A massive portion of catch of the day, calamari, prawns and white bait fried on a light batter, with 2 sauces and skinny sweet potato fries. Cooked to perfection and definitely a seafood-lover dish but maybe a bit too big for two or for a starter. However I’ll be back for sure to have this dish again and again. As we finish our starter, families continue to come in. The restaurant was pretty busy and there was a pleasant atmosphere inside. It was getting a bit cold outside so we asked if they could accommodate us inside; not a problem and they found us a spot in no time. We didn’t realise the restaurant was that busy, I spotted the owner sorting out the orders and food being served non-stop. Whilst we waited for our main course to arrive Patrick kept entertaining us and offering drinks, and not just us but everyone else in the restaurant too! 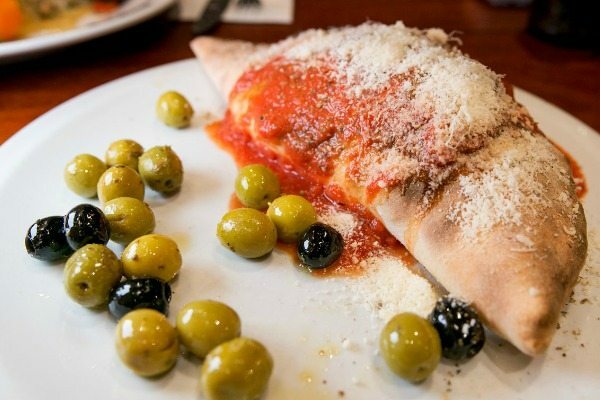 For main course my wife had the Pizza al Calzone which was stuffed with peppers, mushrooms, ham, salami and mozzarella, topped with tomato sauce, oregano and a garnish of olives – a nice vintage touch! The pizza was fantastic, again cooked to perfection and the dough was superb. Thin, crispy on the outside and a touch moist on the inside. Continuing with my seafood obsession, I had Linguine alla Luciano, a flat-ish spaghetti cooked with clams, mussels, prawns, walnuts, fresh parsley and garlic and a touch of chilli… delicious! 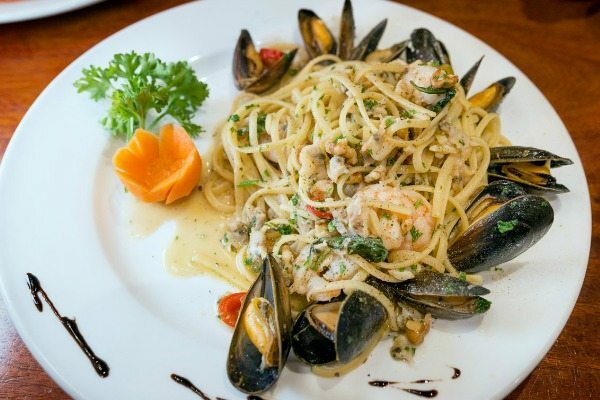 The pasta was al dente, the seafood not too overpowering, the delicate sauce helped to keep all the flavours and textures neat, and you can’t never go wrong with fresh parsley and garlic on a pasta dish. I loved this dish and will definitely try to replicate it at home. We struggled to finish our main courses as the portions were huge. In fact, the restaurant reminds me of trattorias we used to frequent when I was a child, excited to eat pasta with olive oil, garlic and parsley. I love when restaurants and food bring back good memories! No review is complete without a dessert in my opinion so we made a sacrifice for the sake of this article and decided to have one. At first we thought of having something called Gelato del Gladiatore which is tons of ice cream with fruits of the forest, whipped cream, sauce… maybe next time! Instead we went for the Passion al Coco, a more humble option consisting of two scoops of coconut ice cream with toasted almond flakes and mango purée. The ice cream was beautiful! 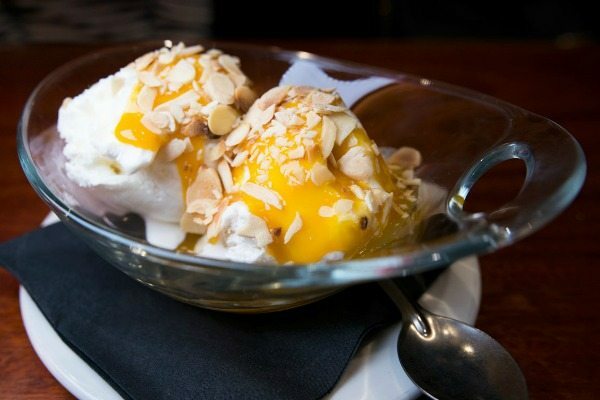 Light, creamy and full of flavour, and the almonds and mango were such a good match that no description will make enough justice to it, you’ll have to go and try it. We both enjoyed our meal, we were glad to see the restaurant buzzing and wish to thank Patrick for being such an amazing host and such a good Restaurant Manager. We’ll be back!